Are you ready for an easy recipe that’s perfect for a special occasion or Sunday dinner? 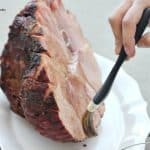 This Baked Ham with Marsala Sauce is the perfect meal because it’s super easy and the sauce only consists of 5 ingredients. You really can’t mess this up, which is why I love making baked ham. This is a sponsored post on behalf of Holland House, but all opinions are my own. When it comes to the holidays or special occasions, I’m not one to try to create an intricate recipe. I like recipes that use a few key ingredients to create amazing flavor that makes it seem as if I slaved in the kitchen all day basting my meat. It’s a trick though. A mirage if you may. That’s honestly why my Perfect Roast Turkey is one of the top recipes here. It wows your company and gets their tastebuds excited. This Baked Ham recipe is no exception to that. 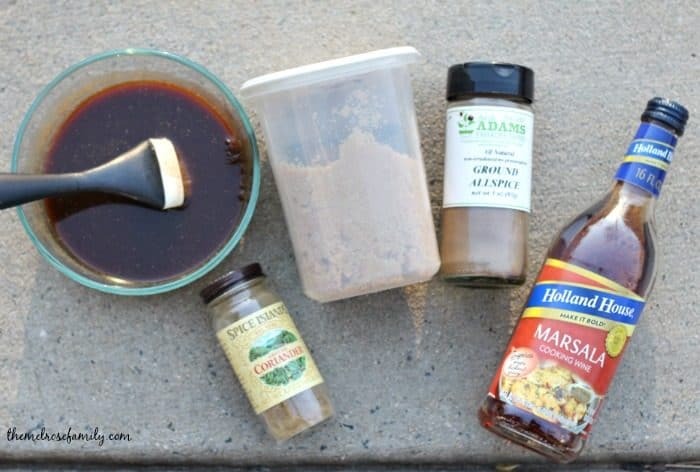 Only five ingredients creates a flavorful Marsala sauce that everyone thinks is an intricate sauce. Mirage! One of the reasons that my sauces are always a huge hit is because of Holland House cooking wines. 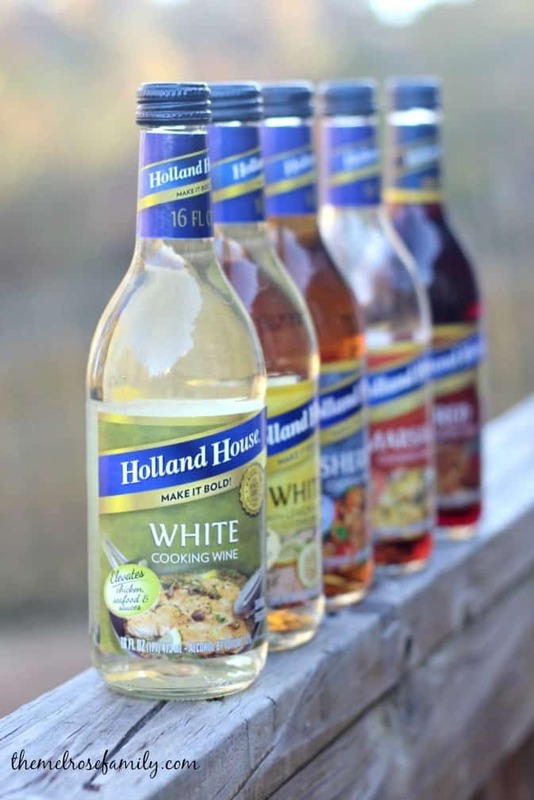 I love being able to add bold flavors to my recipes just by using a Holland House Cooking Wine. Plus, Holland House has an extensive array of cooking wines that consist of White, White with Lemon, Sherry, Marsala and Red cooking wines. They are the perfect addition to just about any meal. My favorite part of this meal is definitely my girls’ reaction to the baked ham. They love hams, but the marsala sauce gave this so much more flavor. We usually serve this ham with our Lightened Up Jiffy Corn Casserole and Honey Roasted Carrots. For another recipe using Holland House, check out the YouTube recipe video from Tatyana’s Everyday Food. To download a coupon for Holland House, visit HERE. You can also find more great recipes on Holland House’s Facebook and Pinterest account. Ready for an easy special occasion dinner? This Baked Ham with Marsala Sauce recipe is as easy as it gets with only a 5 ingredient sauce. In a small pot bring the marsala cooking wine, brown sugar, coriander and all spice to a boil and reduce the mixture by 1/4th. Score the back of the ham with diagonal cuts to make a diamond shape. Press the whole cloves into the vertices where the cuts meet. 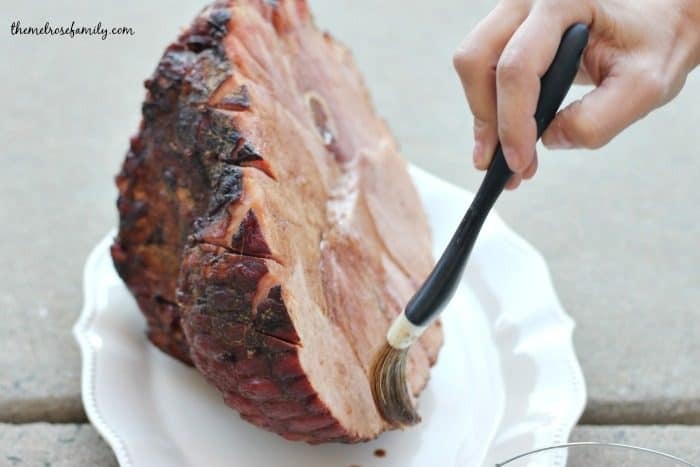 Baste the ham with the marsala sauce. Cook for one hour and baste the ham again with the marsala sauce. Cook for another hour or until a meat thermometer reads 140F. I’ve cooked ham in a lot of things over the years, but have never considered marsala. Thinking about it, it seems like a natural choice! I’m pinning this recipe and am going to give a whirl. Thanks for sharing!